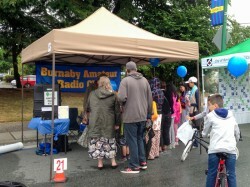 RBY - VHF has been moved from VE7SCC to North Burnaby for the time being. 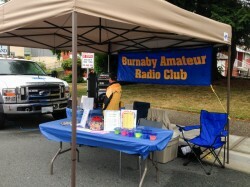 The repeater should be workable in the Burnaby and surrounding areas. We hope to have RBY - UHF running at the same location shortly. We are still waiting for SFU to complete various approvals regarding the new location We appreciate everybody’s patience while this work is carried out. Please check this website for future updates. 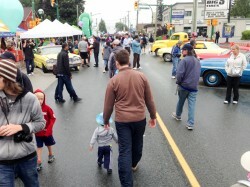 It's that time of year again for the Father's day Walk / Run for Prostate Cancer, at Burnaby Lake on Sunday June 21. This is the 2nd call out for volunteers. This is a good event for people with limited experience, who want to become familiar with operating at a public service event. If you are interested in participating this year please reply via the email below. If there is someone that you know who hasn't volunteered for this event but wishes to do so, then please have them email me so I can add them to the list. If you have a position preference from a previous year, please note it via the location number according to a previous years map. Also please include a t-shirt size so we can have one for you. VE7RBY Repeater systems temporary location. 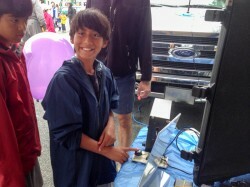 This was our first year at the Edmonds City Fair (and Classic Car and Motorcycle Show). 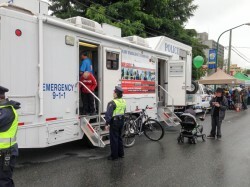 We got to set up between the City of Burnaby's Emergency Program booth and the RCMP Emergency Command Vehicle. It was a perfect spot. We could borrow power from the generator on the Emergency Vehicle and the Grab & Go kit we were demonstrating was one of the big HF/VHF City kits that Lou, VE7CGE, and Ron, VA7AUZ, put together a while back. One of the things that I'm always struggling with is how to get people interested enough to stop and talk with us, especially the younger ones ... they're a tough crowd. So this year I did some asking around and searching of the web and came up with a bunch of activities. Everything was a hit ... the bracelets for the tweens and teens, the QSL cards for the younger kids, the practice oscillator and lollipops with kids of all ages. 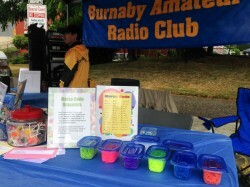 The ARRL website suggests going with beads for the bracelets but I guessed that incorporating the Rainbow Loom stuff would keep things very trendy. I wasn't wrong there. I don't think we had less than three or four people at the booth at any given time. A super big thanks go out to Pete, VE7VPK and Ray, VE7RKG for all their help! 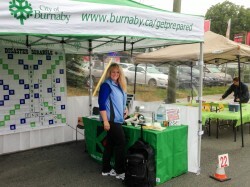 City of Burnaby Emergency Program Booth to the right of us. RCMP Emergency Command trailer to the left of us. 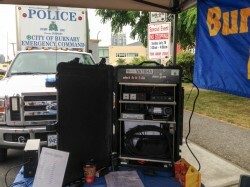 The City of Burnaby HF/VHF Grab & Go kit that we were demonstrating. Despite the rain there were lots of people at the Fair. We always had a crowd at the booth. 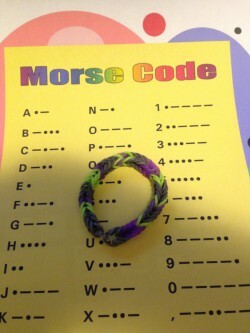 VA7KJW spelled out in Morse code in a Rainbow Loom bracelet. 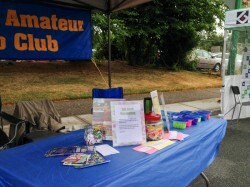 Visit our booth at the Edmonds City Fair and Classic Car & Motorcycle Show Sunday, July 20th from 10am until 3pm. We'll have a demonstration Grab & Go kit and plenty of activities for the kids including Morse code bracelets and DIY QSL cards. Look for us next to the RCMP Incident Command vehicle. We'd love to have you stop by and say hello!